@Matt - I lean towards thinking Nintendo will release more copies at some point. It is almost pure profit for them so it will be hard to resist. When the Wii is no longer being made I can see this game being one of the more expensive Wii titles. Something like Zelda 4 Game Collection. I'm surprised Nintendo doesn't do Donkey Kong All-Stars, Zelda All-Stars, and Kirby All-Stars with collections of older games. @Matt - Good point about the 4 Game Zelda being an All-stars package. I don't think I would buy Kirby either, but I would buy a Donkey Kong Country All-Stars if it had 1, 2, and 3 plus the original thrown in as an added bonus. Maybe Nintendo will do like Atlus does and release the game again, but it won't be "Limited Edition". It would be the same game but packaging would be a bit different. I doubt Nintendo will do this, but they could. I almost pre-ordered the game, but when I found out that it was basically identical to the Super Mario All-Stars cartridge for SNES, which I own, I decided not to. But now that it's selling for more than it cost new, I wish I had bought it, just to resell for profit. I have 6 Mario All-Stars Wii games.Target, Wal-mart, Gamestop, and all the stores across America,They all had/ or got 2 or 6 games on stock that day Dec.12, 2010. So yes it was limited, and yes the game is discontinue, according to a salesman from Target who got an Email from Nintendo. I think it's true because it's Mario 's 25th Birthday. I dont plan to sell mine yet, I'm going to wait and see. @Carlos - So each store you went to only received 2 to 6 on the release date? That is much smaller than I would have guessed. The 25th Birthday thing is probably the one big reason that this might stay a limited edition. 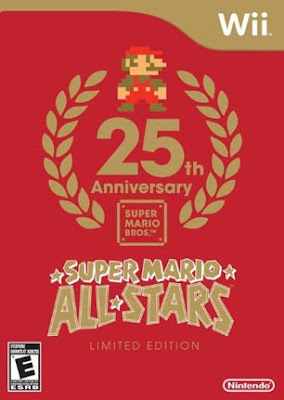 Starting January 1st it is no longer Mario's 25th anniversary. Yes, Mr. Hendricks some stores received 2 0r 6 copies only. I bought 5 games at Sam's Club here in Texas, I left only one copy there, but it's already gone and the other my sister bought me 1 at Sam' Club in Michgan. Can't wait when Mario turns 30yrs old. What is Nintendo going to do? I have a bad feeling it's gone for good. I initially saw a bunch of them when it was first released, but after the holidays, when I went to go purchase it, they were nowhere to be found. I checked every single store, and it's the same. I think it really was a super limited edition! "Can't wait when Mario turns 30yrs old. What is Nintendo going to do?" That's strange, the situation doesn't seem to be the same in Europe, in particular in France. Anybody even know how many copies they made? I was just wondering because mine was pre-ordered 3 months before it actually came out. Just like I have Pokemon White Version pre-ordered since October I think. @Anonymous - NPD didn't have any Mario All-stars data in their top 10 report for December so we probably won't know for sure how many it sold unless Nintendo says at some point. VGChartz estimates that it sold about 820,000. They are usually a pretty decent estimate. The game is definitely not "rare" compared to some games with much smaller printings, but compared to demand they didn't make nearly enough. well what i think is that nintendo is holding off for some time so they can make more money and when got on ebay they where all they way up to $190.00!!!!!!!!!!!!!! !